Our #4 Best Seller of 2017! 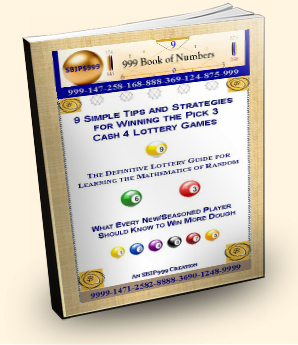 9 Simple Tips and Strategies for Winning the Pick 3 Cash 4 Lottery Games: Your Definitive Lottery Guide for Learning the Mathematics of Random. An SBIP999 Creation. 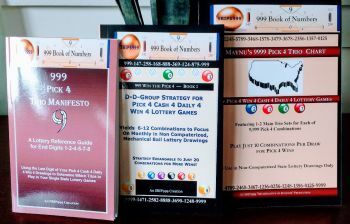 Taking you by the hand and walking you through the forest of “Twin Digits”, “Mates”, “Doubles”, “Mirrors” and “GT9 Values”, leading lottery strategist Ama Maynu (alias SBIP999) has produced a comprehensive, no fluff, and no nonsense lottery manual for serious students of the Pick 3 Cash 4 Lottery Games. Whether you are a newbie or seasoned player, you will learn something new to catapult your game to the next level in this long-awaited Guide. Guaranteed! Want to know which single pairs like to turn into doubles? Or the best time of the month to play your high payout triples and quads, or triples in the Pick 4? This Guide spills the beans from a leader in producing calendar-based lottery predictions. At least six (6) new SBIP999 previously unpublished lottery strategies are unveiled. In addition, you get exclusive insights into the Master Digit 9, which will make finding your pairs and trios as easy as 1-2-3. But, perhaps best of all for Pick 4 Players especially, Maynu lets you in on a previously well-guarded secret on how to use “resistant versus non resistant” digits to win more in the Pick 4. 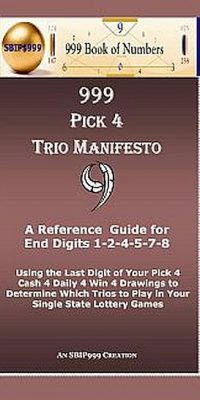 This exclusive concept–discovered after years of study–is so basic, and works so well to find your pairs in the Pick 3 and your trios in the Pick 4, that you will wonder how you ever made a playlist without it. 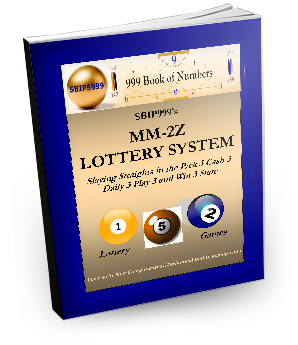 Tip #6 alone–which allows you to distinguish the different types of lottery combinations that fall in your non-computerized, mechanical ball drawings–is worth the price of admission to this Guide. This Chapter is so important to your success in the Pick 4 that SBIP999 gives you four unique strategies to put it to use immediately. “This Guide is the answer to many of my customers who have asked me repeatedly when I planned to publish my ’12 Weeks to Pick 3 Mastery’ Course which I have been threatening to do for years. “But this book is better than such a course for two major reasons: number one, you get to go through the book at your own speed. And, number 2, you will not have to pay for it weekly or monthly, but it comes delivered with a one-off, one time price for all the valuable lessons contained within. 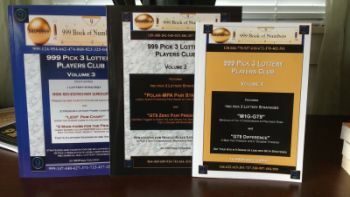 “I learned so much while penning these winning tips based on proven number laws — tips that can make a big difference in your game when you put them to good use. And, yes, I am thrilled at the new “JMIU Lottery Strategy” that was unveiled in the Bonus Chapter of the Guide! Can’t wait to try it out in the Carolinas,” Maynu said. This is the 2nd Edition–most recent–with slightly larger font (13 pt) for ease of reading and is $5.00 cheaper than 1st edition.